We’d love your help. Let us know what’s wrong with this preview of The Complete Fairy Tales by Oscar Wilde. The Complete Fairy Tales of Oscar Wilde includes the two definitive story collections The Happy Prince and Other Tales (1888) and A House of Pomegranates (1891). This volume collects exquisite and poignant tales of true beauty, selfless love, generosity, loyalty, brilliant wit, and moral aestheticism, such as "The Birthday of the Infanta," "The Selfish Giant," The Nighting The Complete Fairy Tales of Oscar Wilde includes the two definitive story collections The Happy Prince and Other Tales (1888) and A House of Pomegranates (1891). This volume collects exquisite and poignant tales of true beauty, selfless love, generosity, loyalty, brilliant wit, and moral aestheticism, such as "The Birthday of the Infanta," "The Selfish Giant," The Nightingale and the Rose," and "The Happy Prince," among others. To ask other readers questions about The Complete Fairy Tales, please sign up. I came upon it in my grandmother's library when I was a kid. Read it furtively, convinced it was dangerous stuff. Read it compulsively, swept away. Eine sehr schöne Sammlung an Märchen. Manche fand ich natürlich besser als andere, aber gefallen hatten sie mir alle. Der Schreibstil ist sehr leichtfüßig und wunderbar zu lesen und das obwohl diese Märchensammlung von 1888 ist. Besonders das Märchen vom glücklichen Prinzen hat mich in meine Kindheit zurückgebracht, da ich es bereits aus den "Erzähl mir was"- Bänden kenne und ich als Kind diese Märchen- und Kindergeschichtenreihe geliebt habe. This is a book that I have been waiting to read for a while now for two reasons. The first is the need to read up on fairy tales from across the World. This was one of those interests that was forever doomed to be in the attic of my mind. I would glance at my wish list and keep the fairy tales aside for just one more time. So finally I mustered up enough resolve and got this book to read. The second reason was that I hadn’t read anything by Oscar Wilde yet and thought of starting from here. It c This is a book that I have been waiting to read for a while now for two reasons. The first is the need to read up on fairy tales from across the World. This was one of those interests that was forever doomed to be in the attic of my mind. I would glance at my wish list and keep the fairy tales aside for just one more time. So finally I mustered up enough resolve and got this book to read. The second reason was that I hadn’t read anything by Oscar Wilde yet and thought of starting from here. It certainly was a good start. This book combines nine stories from two separate volumes : The Happy Prince and The House Of Pomegranates which to sum up are all pretty bleak and depressing. Maybe this was a problem with my expectation of the word fairy tale for I anticipated conclusions which are better and finer for the key characters. Wilde however shows a different world view altogether. He does have the key ingredients of fables in his stories : magic, animals who talk, gods and demons but the situations and occurrences in his stories are closer to real life than fantasy. The good does not always succeed, nice people get cut down fastest and selfishness almost always wins the day. This is not to say that the stories are not enjoyable, they are little gems of the writing craft and quite beautiful in terms of the language. Oscar Wilde is rather unmatched in his description of beauty. Descriptions of nature and of human beings are stunningly evocative and made me yearn for more of it. There is this story of ‘The nightingale and the rose’ which talks about the ultimate futility of sacrifice and the irony of being in love, where at the start of the tale itself you sense that things won’t go right for the poor nightingale making the ultimate sacrifice. The sense of irony in these stories are as sharp as knives. A prime example for this is ‘The Star Child’ where almost everything seems to be going well when in the last one sentence, Wilde turns the whole story on it is head. The story of the happy prince is heartbreakingly beautiful and so is the one of the selfish giant. They filled me with awe and the all-encompassing power of having a gentleness to one’s behavior to fellow beings. The descriptions of lands from far away as told in ‘The fisherman and his soul’ are perhaps the finest descriptions of cultures and people of lands that never will be in existence. To say that Oscar Wilde is brilliant is laughingly absurd and yet this is a must read for anyone who ever wants to know what a really brilliant fairy tale feels like. "The Selfish Giant" and "The Happiest Prince" are some of the best stories ever written. Poor, tortured Oscar Wilde--how did he turn out such beautiful stuff??? A beautiful soul in a tormented body perhaps. I love these stories--everyone should read them multiple times. Bisher habe ich mich ja erfolgreich um Oscar Wildes Werke herummanövriert, dabei fiel mein Interesse schon recht früh auf seine Geschichten. Der "Dorian Gray" ist leider nach wie vor ungelesen, kam mir aber als stilistische Adonis-Narziss-Mischung bereits in Aufsätzen vor. Wildes "Märchen" sind öfter eher Parabeln, Fabeln und traurige Kurzgeschichten mit märchenhaften Elementen. Die Metaphern sind angepasst-überbordernd, manchmal arg kitschig, aber trotzdem treffend und passend für diese merkwürd Bisher habe ich mich ja erfolgreich um Oscar Wildes Werke herummanövriert, dabei fiel mein Interesse schon recht früh auf seine Geschichten. Der "Dorian Gray" ist leider nach wie vor ungelesen, kam mir aber als stilistische Adonis-Narziss-Mischung bereits in Aufsätzen vor. Wildes "Märchen" sind öfter eher Parabeln, Fabeln und traurige Kurzgeschichten mit märchenhaften Elementen. Die Metaphern sind angepasst-überbordernd, manchmal arg kitschig, aber trotzdem treffend und passend für diese merkwürdige Mischsorte an Kurztexten. Es gibt keine typischen "Es war einmal..."-Anfänge und keine "und sie lebten glücklich bis an ihr Lebensende"-Enden, aber trotz allem sind all diese Geschichten zeitlich und räumlich enthoben, haben alle ein fantastisches Element und beziehen sich auf verschiedene europäische und orientalische Erzählmuster und -motive. Was eher märchenuntypisch ist, ist die starke, oft religiös aufgeladene Verklärung des Todes. Mehr als die Hälfte der Kurzwerke enden mit dem Tod der Hauptfigur, dieser ist jedoch mehr Erlösung und Paradiesführung als das Leben, was dieser Mensch zuvor führte. Zudem lässt Wilde durchaus Beziehungen zwischen gleichgeschlechtlichen Figuren/Personen/Tierwesen/Objekten zu, was bei ihm womöglich in anderen Werken ebenfalls anzutreffen ist. It's sometimes hard to read--you can almost see Oscar Wilde mentally beating himself up while he's writing some of these stories, particularly when he writes about beauty. He wrote some of these while in prison, after all. But they're beautiful stories, and my favorite has always been The Happy Prince. Never fails to make me cry. I was swept away to the lands where the stories are set. And I enjoyed every moment of it. The stories are simple fairy tales, probably meant for kids... but as an adult I found them very engaging and thought provoking. There is a charm in the words of the authors that is just irresistible. This collection comprises both the Happy Prince compilation and the House of Pomegranates compilation of Oscar Wilde's short stories. I suppose this wonderful collection has been buried so long because of Wilde's sexual orientation. That's so sad because it means that millions of children growing up over the past several decades have missed experiencing these tales. I'm glad to see that the collection is back in print and have finally found it in my local bookstore. The "Complete Fairy Tales of O This collection comprises both the Happy Prince compilation and the House of Pomegranates compilation of Oscar Wilde's short stories. I suppose this wonderful collection has been buried so long because of Wilde's sexual orientation. That's so sad because it means that millions of children growing up over the past several decades have missed experiencing these tales. I'm glad to see that the collection is back in print and have finally found it in my local bookstore. "The Happy Prince" >> A statue of a prince asks a bird friend to deliver precious gems on his body to people who are in need in the town so that they may survive and in turn is deemed to be no longer beautiful. "The Nightingale and the Rose" >> A Nightingale makes the ultimate sacrifice in the form of a song so that a a boy may win the heart of a maiden. "The Selfish Giant" >> A grumpy giant closes his courtyard off to children so Spring refuses to come back leaving Winter to constantly blunder him. "The Devoted Friend" >> A friend accepts a small favor and is expected to do entirely too much in return. "The Remarkable Rocket" >> A rocket (firecracker) who is quite arrogant ends up being the bottom of the bunch. "The Young King" >> A King has a series of dreams which lead him to no longer want the royal treatment once he sees what it costs others. "The Birthday of the Infanta" >> A dwarf who performs for the Infanta on her birthday becomes obsessively in love with her and is disillusioned on his way to finding her. "The Fisherman and His Soul" >> A fisherman gives his soul to be with a mermaid and learns the hard way the price that he has paid for doing so. "The Star-Child" >> A Child falls from the sky, is taken in by a family, and grows to have a horrible attitude. When he tries to redeem himself, he finds that it may be too late to do so. It isn't an easy job to write a story for children that carries over on another level when the reader is an adult, yet Wilde has done it. Each tale is a gem onto itself: deep and moving, yet profoundly simple at the same time. I'll admit up front that I've never read anything by Oscar Wilde before now, and I think that I'm sorry that I've waited this long. I thoroughly enjoyed his fairy tales, and even found myself underlining multiple passages in the book for future reference. I felt that his insight into life and love and all the joy and troubles that come with both was quite remarkable and still very relevant for our time, even though these stories were written over 100 years ago. I'm sure that if I were more verse I'll admit up front that I've never read anything by Oscar Wilde before now, and I think that I'm sorry that I've waited this long. I thoroughly enjoyed his fairy tales, and even found myself underlining multiple passages in the book for future reference. I felt that his insight into life and love and all the joy and troubles that come with both was quite remarkable and still very relevant for our time, even though these stories were written over 100 years ago. I'm sure that if I were more versed in fairy tales and folklore as a whole I might see more relations between his stories and those that came before, but taking these for what they are I enjoyed them immensely. The particular volume that I have contains both of Wilde's collections, The Happy Prince and Other Tales and A House of Pomegranates, in one volume, and I while I enjoyed all the stories, I found that I did enjoy the stories that were from The Happy Prince and Other Tales slightly more. The stories contained in The Happy Prince and Other Tales are "The Happy Prince", "The Nightingale and the Rose" (my favorite), "The Selfish Giant", "The Devoted Friend" (probable my next favorite), and "The Remarkable Rocket". A House of Pomegranates contains "The Young King", "The Birthday of the Infanta", "The Fisherman and His Soul" (a unique reworking of "The Little Mermaid"), and "The Star-Child" (another unique reworking of "Beauty and the Beast"). Now that the disclaimer is over: this collection surprised the hell out of me. Oscar Wilde is known for his beautiful language, and so I had expected him to be in his element with tales of make-believe, but I did not think I would be able to enjoy as many of these as I did and I'll explain why next paragraph. In addition to the style of writing, there are near-paraphrases in the tales where I would see... the same way that Lord Henry threw his head back on a couch in chapter one of Dorian gray, or the same scene of gaunt trees as one of Wilde's poignant poems. I had to just smile to myself and move on before I ended up losing my place and trying to find a deeper significance. Every lover of the Wilde style should read these. I bet Wilde is rolling in his grave because I called one of his stories boring. Oops. I enjoyed these tales. Each is a credit to the wonderful and dark mind of Oscar Wilde. 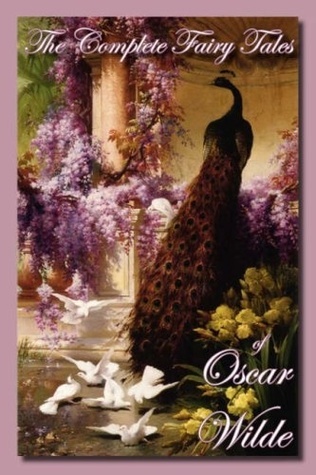 Although each tale is "typical" in the fairy tale style, Oscar Wilde has added his particular style and flair to them. Slightly off the norm, with a twist of dark. I'm a sucker for fairy tales. New fairy tales, never heard before - double the pleasure. Any author that can write "The Happy Prince" or the "The Selfish Giant" with as much feeling as any of he's famous poems demands respect. By far my favourite was the Nightingale and the rose. Love love love! Very, very depressing though. It you want a cute story, don't turn to this. The cutest sounding one in the book is "The Nightingale and the Rose", and guess what: The Nightingale ends up dieing in the end. Such good stories, but be prepared. Best fairy tales ever...just perfect and thoughtful and glorious and irreverent and sad and clever. My very favorite is "The Happy Prince". Such love and compassion! Chọn cuốn này để đọc vào cuối năm là quá chuẩn luôn. Nhẹ nhàng và rất sâu sắc. Embora algumas histórias deixem transparecer a ironia e o sarcasmo que tanto amamos em Oscar Wilde, algumas chegam a ser irreconhecíveis de tanto que enfocam nos bons valores e na moral da história. “Oscar Wilde offended Victorian society by producing works of social mockery, aside from living a scandalous life. Although Wilde's fairy tales were intended for a young audience, they contain social overtones that most children would not understand, but that are meant to project a higher social ethic upon later generations. The criticism of the Victorian society in Wilde's fairy tales is apparent in the parallels between the situations he imagines and real-life situations, and also in the high “Oscar Wilde offended Victorian society by producing works of social mockery, aside from living a scandalous life. Although Wilde's fairy tales were intended for a young audience, they contain social overtones that most children would not understand, but that are meant to project a higher social ethic upon later generations. The criticism of the Victorian society in Wilde's fairy tales is apparent in the parallels between the situations he imagines and real-life situations, and also in the high moral standards that Wilde holds up by contrasting the bad behavior with the good. Instead of beginning his works with a conflict and ending with a resolution, Wilde builds up the conflict without offering a resolution, and unlike most fairy tales, his do not have "happily ever after" endings. The lack of resolution causes the reader to finish the work feeling unfulfilled and dissatisfied with the lack of positive outcome, just as Wilde was dissatisfied with the lack of improvement in his so-called "progressive" Victorian society. The perspective that Wilde conveys in his fairy tales is that society, in general, does not progress. The "paralyzing immobility of life" is directly associated with the exclusive social hierarchy in which people could not transcend their class nor could they be promoted. 12/28/15: It was lovely! Heartwarming, sad, yet still had some funny moments. 1/2/16: What the heck. I can't believe the ending! (view spoiler)[When the Nightingale was singing and dying, I was hurting inside. I wanted her sacrifice to be worth it, but those damn humans just wasted it!? (hide spoiler)] Ugh, I'm so irritated. But it's still mostly beautifully written, though. 1/13/16: I was anticipating Wilde's twist in this story, but the type of twist was a twist itself. It was different from the one in "The Nightingale and the Rose" and didn't leave me as frustrated. This story was actually very sweet. There was a lot of personification which I found cute. There's a bit of a Christian message, but it's forgivable since it's not preachy. 1/16/16: This story had a lot of funny quotes (view spoiler)[such as "'Lot's of people act well,' answered the Miller, 'but very few people talk well, which shows that talking is much the more difficult thing of the two, and much the finer thing also'," and "At present you only have the practice of friendship; some day you will have the theory also," (hide spoiler)]. It was also very obvious in its making fun of people who think so highly of themselves and are quite unaware of it. Despite this, I couldn't rate it higher than 3 stars because it left me so irritated and frustrated. 1/23/16: It's kind of the same as above. A lot of funny quotes, a lot of irritating characters. 1/25/16: This had a beautiful message, despite the religion. 2/25/16: Oh, the cruelties of the beautiful to those who are not. This reminded me of Tyrion Lannister's ordeals. 3/1/16: This story was a little more complex than the others (or maybe it was just longer). A charming compendium of tales that I would describe as some of the saddest fairy stories I have ever read. I can openly cry at The happy prince, the Nightingale and the rose and the selfish giant. Every one has a moralising aspect, pride, greed, lack of respect, the sin of thinking oneself greeter than you actually are, the mocking and putting down of others you perceive as beneath you either in looks or station in life, each is didactic and tries hard to tell the reader that if they have some of A charming compendium of tales that I would describe as some of the saddest fairy stories I have ever read. Every one has a moralising aspect, pride, greed, lack of respect, the sin of thinking oneself greeter than you actually are, the mocking and putting down of others you perceive as beneath you either in looks or station in life, each is didactic and tries hard to tell the reader that if they have some of these flaws in their character that is hurtful to yourself and others. Idealno nakon Metabaruna za vrijeme trudnoće. Fluffy Mr Wilde very nicely written but sugar sweet. These fairy tales have very strong moral lessons to teach, not only to children, but as a reminder to adults as well. Of course, the writing was superlative. I listened to the book in the car, and I enjoyed it thoroughly.